Thanks for visiting! We are more than happy to answer your questions directly, please feel free to contact us if you cannot find the answer to your question. Simply hold your device over the barcode. Your device will automatically focus itself, scan, and capture the VIN. Make sure the whole barcode is visible on the screen, and align the red guideline across the middle of the barcode. If you’re having difficulty capturing the VIN, we recommend using a slow sweeping motion over the barcode, or slowly moving the mobile device closer and further away to get the optimal scanning angle across the full barcode. Center the barcode within the red square guidelines on the scan screen so that the whole barcode is inside the square. If you’re having difficulty capturing the VIN, we recommend turning the phone vertically, as well as slowly moving the mobile device closer and further away to get the optimal scanning angle within the square. 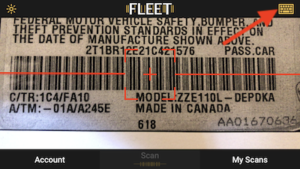 Please note that Fleet only captures QR codes encoded with a 17-digit VIN. General QR codes will not scan. If there is low-light, we suggest turning on the mobile device light using the flashlight icon in the top left of the scan screen. If the barcode fails to scan, please send a photo of said barcode to info@pixovin.com. If a barcode is not present, you may enter the VIN manually by tapping the keyboard icon at the top right of the scan screen. How many custom fields can I add? You can add as many fields as you would like. You can edit these fields from your account at any time. 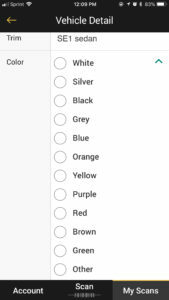 How can I add dropdown values to my custom fields? Improve the efficiency and consistency of your Fleet subscription by including dropdown values for your custom fields. Dropdowns will save you and your team many hours of typing in content, prevent typos, and keep entries consistent across vehicles. If you’d like dropdown values setup for some or all of your custom fields send the field name and dropdown options you would like to pixovin@pixotech.com. How do I export more than one scan? To export or delete a group of scans, go to the My Scans tab and choose Select in the upper right-hand corner. You will then be able to select the vehicle scans and details you wish to export. Where do I submit technical questions? We love feedback and questions! Please contact us to submit technical questions or requests. How many users can use my Fleet subscription? Each subscription is usable by one unique user. PixoVIN expects to release an enterprise Multi-User version of Fleet in mid 2018 that will allow an administrative user to set up seats for other users under one Multi-User subscription. Sign up here if you’d like to be alerted when Fleet Multi-User is released. You have 14 days to try out the benefits of Fleet. We’re sorry to hear you won’t be continuing use of Fleet. Once your free 14-day trial expires, you will no longer have access to the account. You do not have to take any action to cancel your trial. We would love to hear why you are discontinuing use of our service, send us your feedback to pixoVIN@pixotech.com. A Fleet subscription costs $39.99 USD/month. 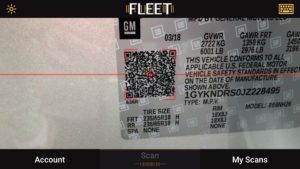 With a subscription to Fleet, you get access to the app’s full feature set: scan vehicle barcodes, add custom vehicle info, share and export data, and more! Your email account gives you access to one Fleet account. Click the Subscribe button in the Fleet mobile app on your Android or iOS device. Any unused portion of the Fleet 14-day free trial will be forfeited once you purchase a Fleet subscription. Your Fleet subscription will automatically renew every month. Your Stripe, Google Play or iTunes account will be charged 24 hours prior to the monthly renewal date listed at the top of your Fleet Account. The monthly renewal date is based on the day you subscribed to Fleet. To stop automatic renewals, turn off the auto-renew setting in your Stripe, Google Play or iTunes account at least 24 hours before the end of the monthly subscription period. Tap Subscriptions (it will be listed under Personalized Recommendations). You can tap Cancel Subscription to cancel your subscription. If you cancel, your subscription will stop at the end of the current billing cycle. For more detail, see the Apple support page on subscription cancellation. For more detail, see the Google Play support page on subscription cancelation. Go to the Account section of Fleet, navigate to the “Manage Subscription” section of your account. Tap the “Cancel my subscription” button. A confirmation modal will pop up and you will tap “Cancel” to cancel your subscription. If you have any issues canceling, or have any questions about your subscription, we are happy to help! PixoVIN offers custom print stylesheets to enhance your Fleet experience. Each print stylesheet is unique, and requires custom effort to create. To receive a quote to add printing to your Fleet account, please fill out our contact form. Once your custom print stylesheet has been enabled, your export option to Print your export will be turned on. Before you can print from Fleet, you must enable mobile printing on your device and make sure you have access to a mobile-enabled printer compatible with your device. To print from your iPhone or iPad, you will use AirPrint with an AirPrint enabled Printer. Please make sure your printer is on this list of AirPrint Printers. If you are having issues with AirPrint, please visit Apple’s support page about how to print. Many printers come with an Android mobile app or plugin to enable printing. Follow the instructions on your mobile-device-enabled printer to continue. Helpful third-party article about printing from Android phones and Tablets. Google Cloud Print is another way to print from an Android Device. This article has information about setting it up. List of printers for Google Cloud print. Download the Cloud Print App. Add a printer to Google Cloud Print.